With winter fast approaching, there’s no better time than now to prepare your dreadlocks for the upcoming change in seasons. 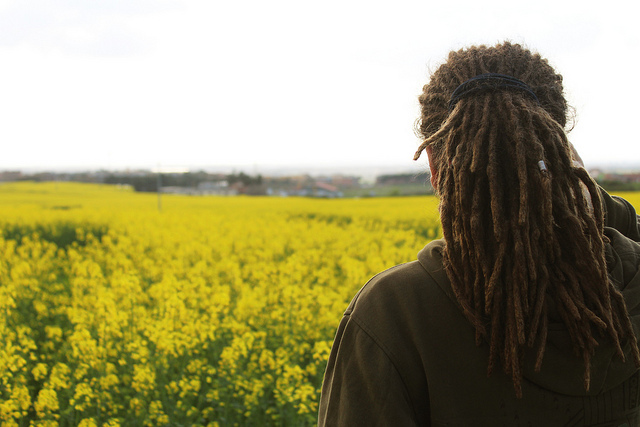 Many people are surprised to learn that seasonal changes can affect their dreadlocks, causing them to dry out, develop frizz (we discussed this in a previous blog post), or even crack at the tips. Problems such as these are easily avoided, however, by following some simple steps. One of the biggest threats to dreadlocks during the winter is low humidity. The term “relative humidity” is used to describe the ratio of moisture vapor in the air to the total amount of moisture vapor that the air can hold. Technical jargon aside, the lower the humidity levels, the drier the air. Winter is known for having low humidity because the air is cooler and therefore denser than warm air, meaning it cannot hold as much moisture. And when the air is dry, your dreadlocks will naturally become dry as well. In order to combat the problem of dry hair during the winter, you’ll need to condition your dreadlocks on a regular basis. I normally caution against the overuse of hair products on dreadlocks, simply because it can weigh them down while leaving them looking oily and unnatural. During the winter, however, your dreadlocks will need a little outside help to prevent them from drying out. Organic coconut oil is an excellent moisturizing product to use on dreadlocks. Applying it once every couple of days will ensure your hair remains moist and healthy throughout the otherwise dry winter season. It’s also recommended that you cover your hair when going outside during the winter. Why is this necessary? Well, the cold temperatures will further deplete your dreadlocks of its moisture content, causing it to dry out and become hard. Ideally, you should wear a cap that’s made of a synthetic fabric like polyester. Synthetic fabrics such as this won’t absorb moisture from your hair; thereby, locking in the moisture and preventing your hair from drying out. No, that’s not a typo. With the winter holidays fast approaching, many people begin to slack off with their diets. Consuming a diet that’s rich in sodium and sugar will take a toll on your health in more ways than just one. In addition to the impact it has on your weight, it may also slow down the growth of your dreadlocks. A better approach is to base your diet around lean meats, fresh fruits, and fresh vegetables, as this will stimulate your dreadlocks, allowing them to grow faster.